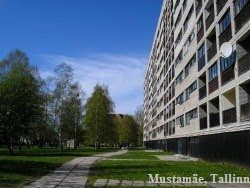 Photos taken in a beautiful spring day at Nooruse street where there used to be some school buildings and dormitories but now new buildings have been built by Univesity of Tartu. This is new archive building, not a University of Tartu's one. This rusty prison is actually Physics Department. This is most terrible thing that happened: the Physics Department moved out from one of the top 5 nicest looking soviet time buildings in Tartu to a brand new top 5 worst looking buildings... I'm just gobsmacked about it. First time when I see these two flowers together. Not sure where that was, probably close to Tammelinn. Vaksali street under heavy renovation. Museum of Oskar Luts at Riia street. Not far from the centre. In front of the Library of University of Tartu.